I know, I know. It's been almost six months since I posted to the blog and I haven't been keeping things updated very well. I do have an excuse, we did get married in May, I taught in NC through the Christmas break in NC and then we up and moved to Northern Virginia because my husband accepted a new job. The move has been AMAZING for us. We could not be more tickled about the location, our jobs or the opportunities that they are providing. However, since we've been here this North Carolina girl has seen more snow in two months than I've ever seen in my entire life. I think we've had around 13 snow days for school since I've been here and I've had a little bit of time on my hands. I mean, that is between unpacking, decorating, taking care of relocation documents and taking on a new teaching position in the middle of the year. Today we ended up with a glorious NINE inches of snow on the ground. NINE!!!!! It's the first of our snow days that we had enough snow for my Maryland native husband to come home in the middle of the day to hang out with me, which I loved! Needless to say, we'll be out of school tomorrow, so I decided to play with one of my toys from Christmas that I've been itching to experiment with.... my Silhouette Cameo. Since we got married I have been monogramming everything (well, kind of). I've always loved monograms but I knew two years ago that it would be changing once we got engaged, so I had to hold off. Since May, when we got married, I've gone a little crazy. You'll need to begin by launching the Monogram App and going ahead and purchasing the extra fonts. Trust me, it is totally worth it because a circular monogram fonts are expensive!!! I've priced them and the Monogram App is the way to go. 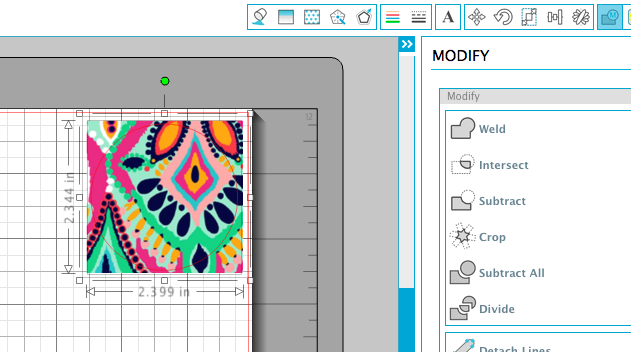 If you plan to cut and print because you LOVE the beautiful designs in the app, you'll need to create two monograms: one with your preferred background and one with your preferred monogram. I had to do this because the original design I chose was very intricate and Silhouette wanted to try to cut all of it out when I traced the image (see below). If you only plan to cut the monogram, you can just create the black monogram. 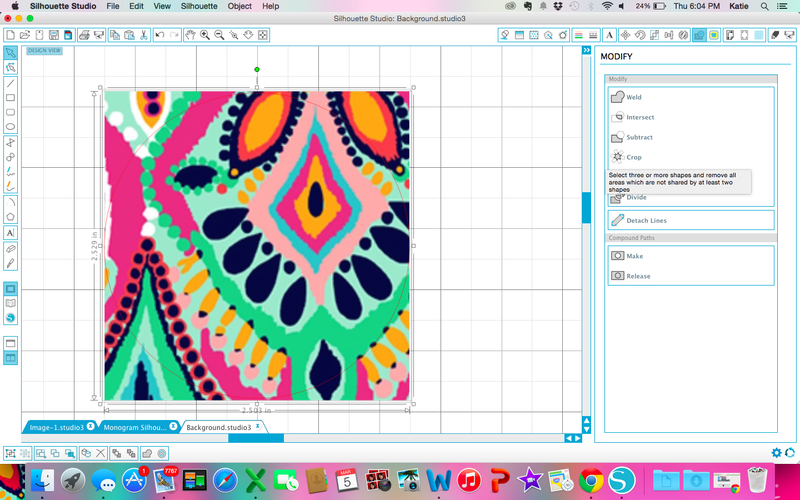 I started by cropping monogram 2 so that I had just the design to print (I chose to use the top right corner). This would become my background in Silhouette Design Studio. I opened the design studio and imported my selection. I had already measured the inside of the key chain and knew that it measured 2.25 inches in diameter, which would be the diameter for my circle on the design. 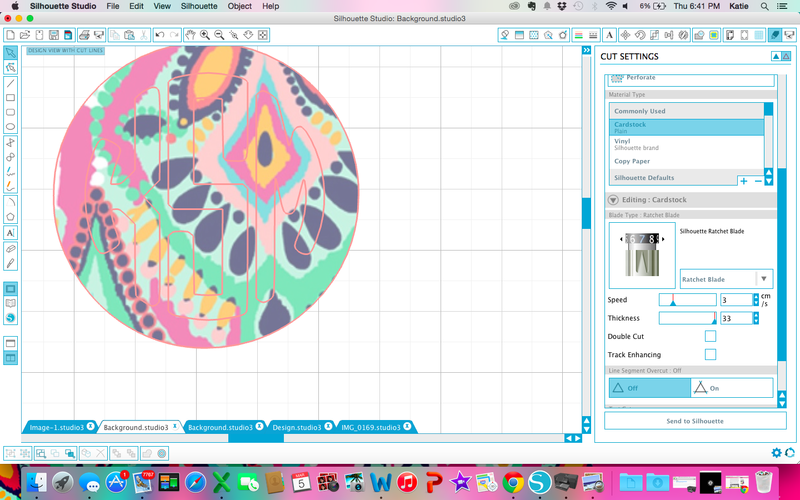 Create a circle that is 2.25 inches in diameter and drag the circle on top of the image that you have imported. 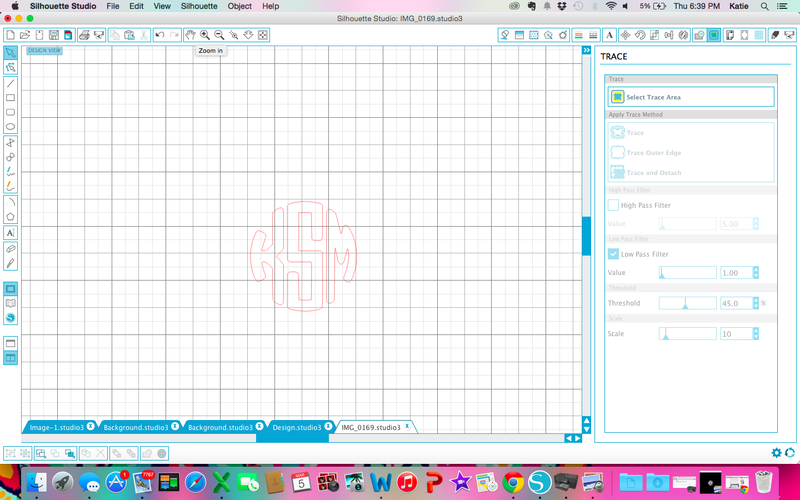 Once you have that set, you'll want to create your monogram. I opened a new tab and imported my black monogram. This is where I ran into an issue. When I went to trace, it kept selecting way too many things. This is where I have go give a shout out to Magnolia Lane on helping me figure out how to get just the monogram font. Once you have your monogram you'll want to go to the Trace button (looks like a yellow and blue butterfly in my opinion). 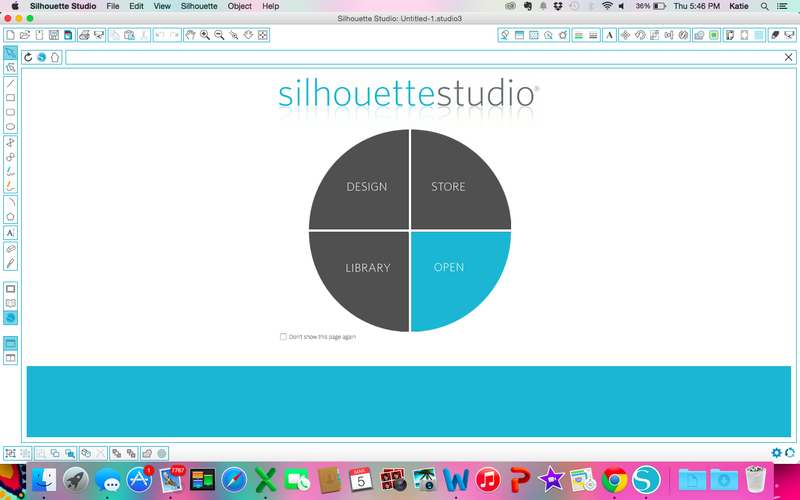 The trace button will help create the outline you want your Silhouette to cut. 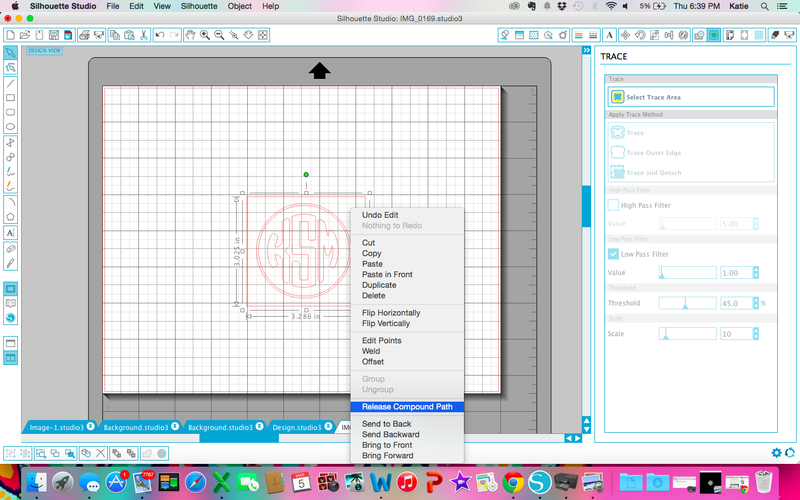 From there you will click on Select Trace Area and create a square over your monogram. This is the most important part!!! Instead of selecting High Pass Filter, uncheck it and click Low Pass Filter. Your square will turn from gray to yellow. This is a good thing! 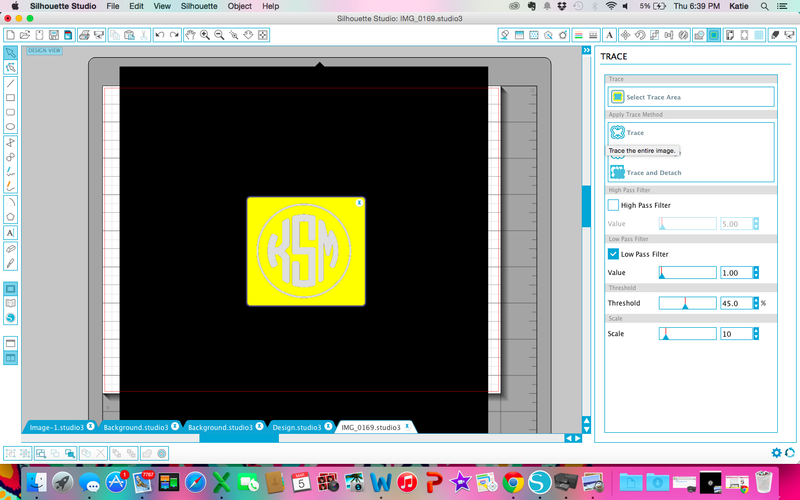 Once you've done this, click TRACE and then you can click on the black part of your monogram and delete the background. The red trace lines will still be there. Now, to get rid of the lines we don't want you'll select the entire monogram and right click. Click on Release Compound Path. Doing so will allow you to select each line that you don't want and then delete them. I deleted everything except for the monogram. I also chose to delete the circles because I wanted to have control over the size of my letters. I promise, from here it is easy as pie. 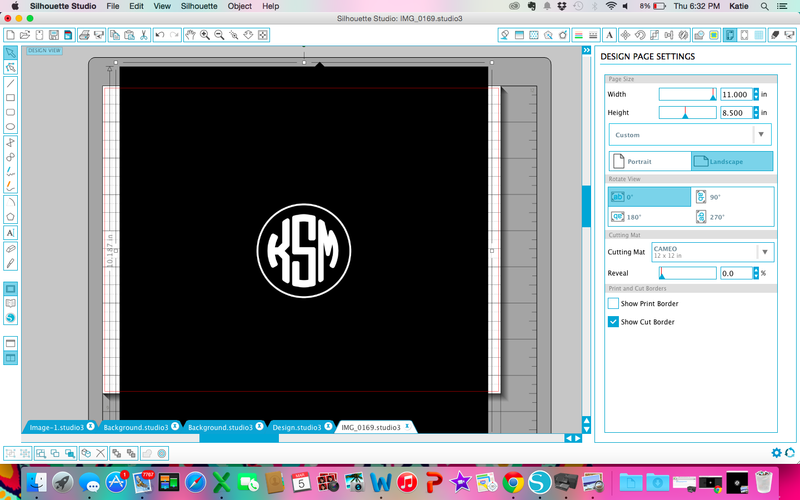 Selecting the entire monogram, copy and paste it back into the document where your cropped circle was with the design. Adjust the monogram so that it is centered and the same size as your circle. If you are using a cardstock with a design, you can just send this to the Silhouette to cut (Cut > Standard > Cut) because your circle and letters are set to go and it doesn't matter where on the designed cardstock it will cut. 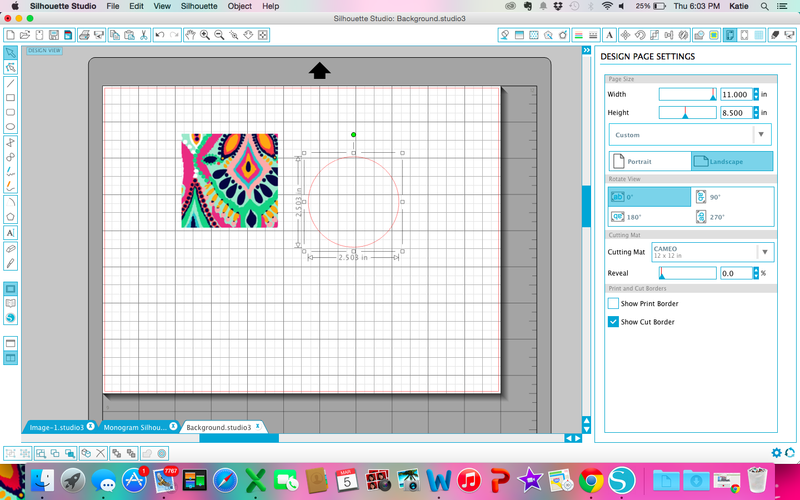 If you are printing the design on white cardstock, I took three extra steps. 1. 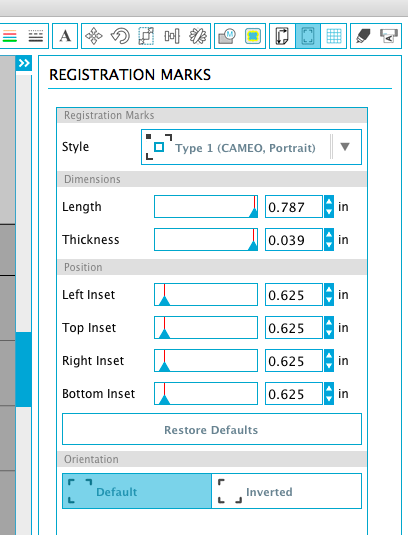 Add your registration marks by clicking on the registration mark window. Make sure your design is inside of red and gray lines. Click print. 2. I wanted color on BOTH sides of my monogram cut, so I added the same selected image from earlier to another Studio tab and printed it on the opposite side of the paper so that I'd have color on both sides. 3. With the paper lined up precisely on the cutting mat, load the cutting mat and send the document to cut on the Silhouette. It will use your registration marks to cut the circle and monogram EXACTLY. From there I cut it out, popped open the key chain and inserted my beautiful design. Voila! You've got an adorable monogram key chain. I hope you enjoyed and be sure to comment if you have any questions.